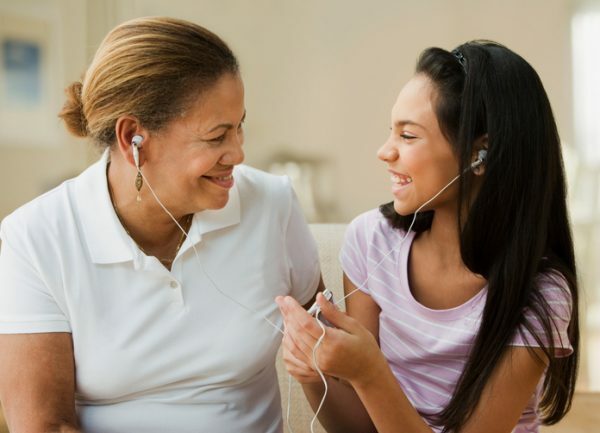 Among Hispanics, there are passion points or connections that align with the culture – family, music and food. Perhaps that is why Grocery is one of the top categories where Hispanics are more apt to spend their money, according to the Selig Center. Additional categories that capture this segment’s spending are clothing, cellphone services and vehicle financing. 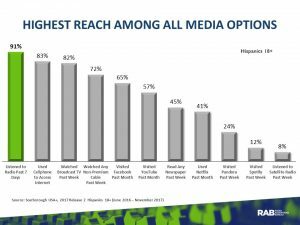 When it comes to media usage, radio is the top medium to reach this group, tuned in to by 42.3 million Hispanics weekly – and used more than any other media option. Who spent $200+ on groceries in the past week – 92%. Who purchased any children’s, men’s or women’s clothing this past year – 93%. Who plan on purchasing a wireless/cellphone service this year – 92%. Whose household plans to buy a new vehicle or currently has an auto loan – 92%. 48% state that radio puts them in a good mood. 45% tune in to radio for relaxation. 40% use radio to stay informed and up to date. 38% tune in for just pure entertainment. 35% see radio as a way to escape. Connecting with consumers is important to all advertisers. Connecting with Hispanic consumers with a buying power of $1.5 trillion is even more important. As a truly mobile medium, broadcast radio can help drive that all-important connection. With all due respect, Ms. Malave, are you saying, any/all stations will benefit from this segment of the population? Or are you speaking only to Hispanic Radio and how they will gain ROI? Alan, Thank you for your comment. It is important for everyone, stations and advertisers alike, to keep this target group top of mind. And yes, some radio formats beyond Spanish language and Hispanic formats may benefit if this group is part of their listening audience. Next Next post: Radio on Main Street Podcast Featuring Dan Vallie, President of the National Radio Talent System.